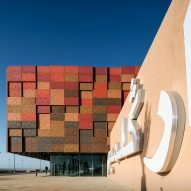 Groupe3Architectes has completed an airport for the city of Guelmim, in Morocco, featuring a light-filtering facade made up of panels of multicoloured metal-mesh. 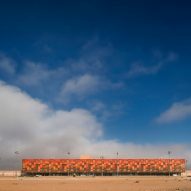 The airport designed by the Rabat-based architecture office, is located on the site of an existing military base around three kilometres north of Guelmim, in southwest Morocco. The city is often referred to as the gateway to the desert, due to its position in the southern Anti-Atlas Mountains near the northwestern edge of the Sahara. 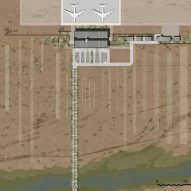 The key criteria for the airport's design were simplicity, efficiency, environmental control and longevity, which was achieved by developing a proposal that can expand if required. 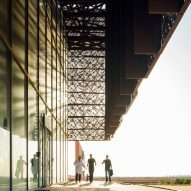 "The main issue of the project was providing the maximum amount of natural light and ventilation to avoid expensive technical equipments," the architects explained, "while optimising the view of the surrounding landscape, which facilitates movement and flow of the building’s users." 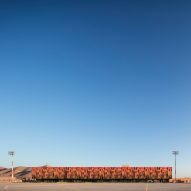 The airport is arranged in a line that extends parallel to the runways and was constructed in two phases. 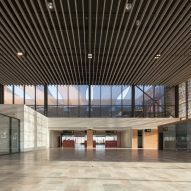 The terminal was completed first and was later joined by a pair of lower structures at either end accommodating a free-trade zone and duty-free area. 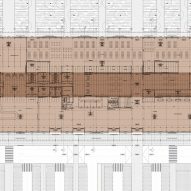 The terminal building comprises two double-height halls containing the check-in areas, departure lounges, customs and baggage reclaim. The airport's public areas look out through large windows towards the landscape on one side and the runways on the other. 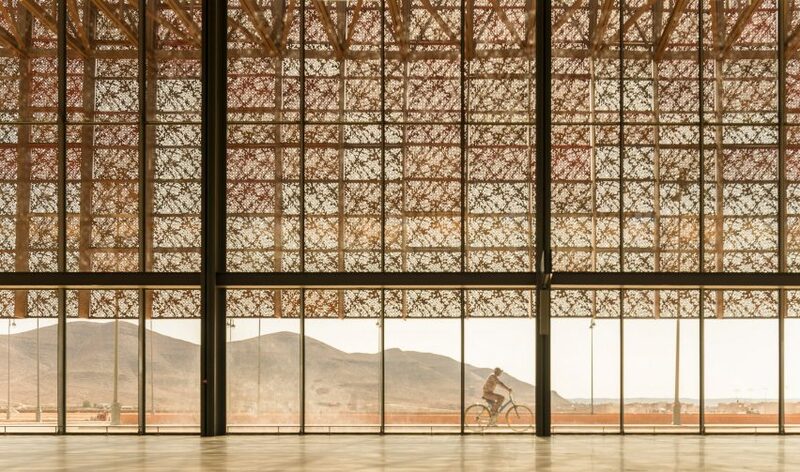 The expansive glazed surfaces are shielded from the harsh desert sun by a screen made from coloured metal panels that are suspended around the perimeter of the building. 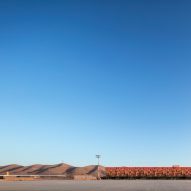 The metal surfaces are finished in a range of complementary colours to create a patchwork effect that is intended to recall the region's traditional decorative styles. 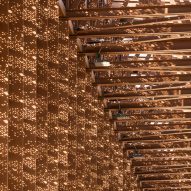 The panels are offset across the length of the facades, which helps to break up the visual mass of the structure by introducing a dynamic pattern of light and shadow. 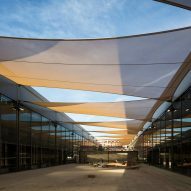 A section of the roof running along the spine of the terminal was removed to create a large patio topped with tensile sun shades, which enables daylight to flood into the building's central areas.